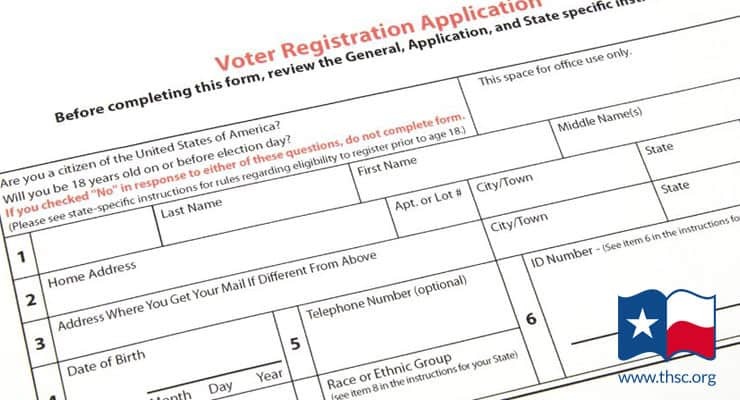 According to the U.S. Census Bureau, the State of Texas is ranked 42nd out of all 50 states in voter registration. You would think as proud as Texans are, we would be the loudest as well. This is a serious problem, considering all of the generations current legislation affects. Can Texas be loud and proud with this ranking? They are listened to with interest: Senators and representatives in Austin and in Washington, DC listen to registered voters’ opinions, not those planning to stay home on Election Day. Representatives on the state and federal levels of government are elected by the voting constituents of their respective districts. Therefore, they are held responsible and accountable to voice the issues that are relevant to their voting constituents. They have effective advocates: THSC President Tim Lambert has a common saying, “ . . . every time the legislature meets, our parental and home school rights are at great risk.” This is due to the differing and inconsistent views of our individual liberties as parents and home school families. The representatives and senators that are most invested in the fight to Keep Texas Families Free are those who serve to protect and expand parental rights and home school rights within reason. However, it is only possible for those legislators to work for your family if they are voted into office in the first place. For example, Sen. Charles Perry from Texas Senate District 28 listened to his West Texas constituents and represented Texas home school families as an outstanding public servant this past 84th Texas Legislature in Austin. He authored Senate Bill 1543, known as the Equal College Opportunity bill, which passed both the Texas Senate and Texas House of Representatives unanimously, and was signed by Governor Abbott this past summer. This new law prevents state colleges and universities from setting discriminatory standardized testing policies for home school graduates. This significant victory for Texas home school students and families occurred because of the voting constituents of West Texas choosing a senator who fights for their highly valued freedoms. On the other hand, the same cannot be said for Rep. Debbie Riddle of House District 150. Representative Riddle was one of the single most crippling roadblocks to conservative legislation this past legislative session. Although she voted and argued against several pieces of conservative legislation, Representative Riddle lost all the respect and support of the Texas Home School Coalition when she refused to support or even review House Bill 524. The Texas Parental Rights Restoration Act (TPRRA), as it is called in Austin, would change the abused judicial process of suddenly transferring parental rights of single parents to grandparents without clear and convincing supporting evidence. The process would have been altered from requiring a preponderance of evidence, to clear and convincing evidence that the child’s parents are not fit to care for the children. This bill would have ensured that parents in the State of Texas received a fair trial and that children were not removed from their parents by vindictive in-laws without probable cause. If more Texans had been registered voters, would Representative Riddle have blocked important legislation for single parents and their rights? Does she truly represent Texas families, or does she represent the minority of registered voters? These are two very different examples of public servants elected by the voting constituents of their districts. Although no senator or representative is perfect, it is the responsibility of the voters to elect public servants who will properly represent their interests. If we want the legislators’ interests to include home school and parental rights, then Texas home schooling families need to vote. It is our constitutional right to vote in every election for the people who represent us on every level of government. Please take the time to register to vote and help us continue to strive to elect senators and representatives who will properly represent parents and home school families. Consider supporting or joining THSC today as we continue the fight to Keep Texas Families Free.